YOU have a HIDDEN POWER. It can reveal someone’s true intentions. It can turn the tables on a negotiation. And you can unlock it TODAY! Today, I'm excited to introduce you to a phenomenon that will change the way you do business. It's a hidden power that enables you to read people with pinpoint accuracy and then subconsciously influence their thoughts, behaviors, and actions. In fact, you can even take this incredible skill home with you to better influence a loan officer, car salesperson, or your friends and family. There's no getting around it... once you learn how to wield this astonishing power, you hold an everyday advantage to take your business and your career to uncharted waters of success. Yet, virtually NOBODY'S doing this! Look around. Businesses are closing left and right. What used to be a hair salon on the corner is now a donut shop. And in six months will probably be a pet store. And in the corporate world, sales are stagnant, margins are paper-thin, and employees are clinging to their jobs as if hanging from a ledge about to drop into the abyss of unemployment. While we all have our eyes glued to the economic reports and buying trends, we should be turning our attention to the one person who holds the hidden power to rise above the economy and achieve greatness... OURSELVES! That's right, within YOU is a force that holds the potential to make customers, colleagues, new business, and salary increases gravitate right to you. A hidden power that costs nothing to implement, yet just as soon as you discover it (as early as today), you can begin to use it (tomorrow or next week!). Learn it and you'll naturally become among the most powerful and influential people in your office. No matter your title or experience. As soon as you start, you'll know it. Before long, everyone else will sense it too. Yet, as potent as this gift is, so few know about it. But for the few who do know how to use it, they seem to have an invisible force surrounding them that virtually commands success. As the author of the bestselling Nightingale-Conant program The Power of Body Language, Joe Navarro brings his spot-on insights into human behavior to the competitive world of business. Introducing Your Hidden Power: Using Nonverbal Intelligence to Propel Your Business or Career to Excellence. Throughout four CDs, Joe personally teaches you how to master nonverbal intelligence, the ability to interpret and use nonverbal signals—in poker terms, "tells"—in business to assess and influence others. Drawing on his three decades in the behavioral sciences, Navarro shows how to decode what's really being said at meetings, interviews, negotiations, presentations, business meals, and more. Because Joe is personally sought out by CEOs worldwide, his calendar is usually booked solid. When he's not conducting a seminar or training a Fortune 500 company, you can usually see him being interviewed on programs such as NBC's Today Show, Fox News, CNN, ABC's Good Morning America, and CBS' Early Show. But today, by trying Your Hidden Power, you'll have him and all of his secrets to yourself. To ratchet-up your sales, to give your start-up business a significant edge, to put you on a career track to upper management, president, or CEO... simply by utilizing your new hidden power! Yes, I'm ready to use my hidden power to increase my sales and improve my business or career! I can ORDER NOW and SAVE $60! How can you truly affect your business, your sales, and your career simply by projecting and interpreting nonverbal behavior? The foundation lies in psychological comfort — the level by which we meet or exceed the needs, desires, preferences, aspirations, or intentions of others. Simply put, when you have it, you thrive. When you don't have it, it's impossible to succeed. And here's what is so magical about it: The second you create psychological comfort for others, they will want to spend more time with you. They'll want to do business with you, want to pay you handsomely for your services, or want to lend you the money you need. Because it rewards people in a deep and profound way, Joe Navarro teaches us that the foundation of achieving greatness begins by both giving and receiving the psychological comfort we all need. Create psychological comfort and you will drive business to you. People will actually go out of their way to do business with you... even when they don't need to. As a viral perk, people will also want to talk about and promote your business for you. But science tells us the opposite also holds true. When there's psychological discomfort, people don't grow. Stress, anxiety, and sickness follow them around. And they are incapable of achieving their full potential. That's why it's so important to learn the cues behind the model of comfort and discomfort. Once you do, you will notice things you never have before. You'll instantly pick up on thoughts, desires, intentions, and issues that other people have... even before they speak a word! You'll also become supremely more empathetic because you'll be a masterful observer and communicator. You'll have an advantage that your colleagues, competitors, customers — even your boss — will clearly notice. And as soon as they do... your business or career will take off to heights you've never known before. "One of the best presenters in America." "Joe’s material has changed my life." "Already I can see the changes in my staff. I wish Joe had taught me this 20 years ago when I started in sales." "An hour was not enough. I suspect a day would not be enough either. Truly informative and entertaining!" "Best speaker all year – Get him back!" "Funny, informative, clever. I could have listened to Joe for hours." Read body language to understand what clients, co-workers, interviewers, or interviewees are thinking, feeling, or intending, and discern nonverbal cues of concern, disagreement, or doubt — even over the phone. Master the all-important first impression and use settings, seating, and gestures to inspire and captivate. Recognize the elusive habits that send the wrong message, and discover what posture, work practices, workspaces, and even electronic habits say about people. Become culturally aware and gender-sensitive, from best handshake practices to personal-space preferences. Learn what the "comfort dividend" can do for you and your business. Explore how the concept of "curbside appeal" applies to you and your business, and can mean the difference between average and exceptional. Discover the single most dominant behavior that communicates supreme confidence. Use it in job interviews, sales meetings, and important negotiations to project your power. Is your customer very interested in your product or just somewhat interested? Is the car dealer a little too excited about the offer you just proposed? Look for these gravity-defying face cues that will give them away every time. There's one inadvertent behavior that our brain reserves for when things get really bad. See someone doing this, and you can bet they've just experienced a traumatic setback in their life: Divorce, job loss, death of a loved one, or a health scare. Beware of the Handshake from Hell! Receive this handshake from a vendor or colleague, and he or she is essentially claiming superiority over you. Offer this handshake, and you'll turn people off in seconds! Regardless of the content of your presentation or speech, the audience might not believe you! If you engage in this unassuming behavior, you are essentially telling others that you are holding something back. Most people think that folded and crossed arms means we're "blocking out" other people... WRONG! It means something else entirely! Joe Navarro proves much of what we think we know about nonverbal intelligence is incorrect and dangerous! From across the room, be able to spot if someone is stressed, threatened, or worried. Because they MUST engage in this one behavior REQUIRED by the brain... it's NOT optional! Salespeople and managers: Learn the telltale sign that instantly divulges your prospect's TRUE level of interest. In fact, by using the secret of Ventral Denial, you'll know without a doubt in just seconds. Forget what he says... WATCH him! Discover the most honest part of the body... And it's NOT the face, the eyes, or the mouth. Even the best poker player in the world can't hide his or her intentions in this part of the body. Works every time! Try it on your colleagues, your friends, even your spouse. PLUS, you can now attend one of Joe Navarro's sold-out seminars... from your living room! In addition to the four strategy-packed CDs you get in Your Hidden Power, you'll also receive Joe Navarro's extraordinary DVD titled An Ex-FBI Agent's System for Reading Body Language. In this crash course in masterful communications, Joe Navarro speaks before a live audience. From the first minute to the last, he gives away his closely guarded FBI career secrets for precisely how to use your body and observations for both professional and personal gain. Watch closely with notepad in hand because Joe reveals the hidden communication found within each body part in detail... starting with your head and going down to your toes. He debunks the falsehoods that you thought you knew and exposes powerful nonverbal cues people inadvertently give off. As an EXCLUSIVE BONUS for Nightingale-Conant customers, you'll also benefit from Joe Navarro's LIVE Question and Answer Session. Watch as Joe's audience asks him the very same questions that you also want answered. Which nonverbal clues indicate deception? What body language communicates the most confidence? How can you give off the right impression using nonverbal communication? Joe's audiences describe him as "dynamic," "superb," and "captivating." 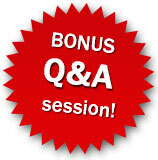 After watching this DVD as well as the Q&A session, you'll describe him as "an incredible windfall to my business!" Order Your Hidden Power RISK-FREE today! will significantly improve THIS YEAR! As always, your order is completely risk-free because your satisfaction is guaranteed. Order today, and if for some reason you're not completely satisfied, you can return Your Hidden Power at any time during the next 30 days. We'll issue you a full refund of the program price. As a business professional, I'm sure you've read all the latest business bestsellers. Maybe you've even tested a few programs. Perhaps they helped, perhaps not. I can promise you that Joe Navarro's Your Hidden Power is unique and unlike anything you've ever experienced. It doesn't cover sales strategy. It doesn't rebuild your marketing plan. And it doesn't require you to add a single red cent to your budget. What it does is details the ONE area of business that is more influential, more immediate, and more beneficial than all the rest. All the marketing in the world can't persuade a customer to keep buying from you if there's somewhere else he'd rather go. But if you can connect with the customer using these advanced techniques in psychological comfort... you WILL have a customer for life! But please, we encourage you to prove it to yourself! Order the program right now; try the dozens upon dozens of nonverbal cues that Joe Navarro offers. Then watch what happens... to yourself and your business. If you find that I've exaggerated my claims in any way and your business or career has not significantly improved within 30 days, we want you to send the program back for a full refund. We know the hidden power that exists within you is extraordinary! I look forward to receiving your order and learning about your profitable business success! YES, I want to use this FBI-proven system for nonverbal intelligence to accurately read and influence my customers', colleagues', and boss's real thoughts, true intentions, and ultimate actions! 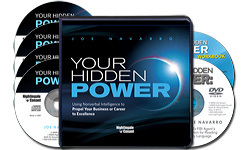 Please send me Joe Navarro's NEW 4-CD audio program Your Hidden Power: Using Nonverbal Intelligence to Propel Your Business or Career to Excellence, plus Bonus DVD and Live Q&A Session for $69.95 which is $60 OFF the regular retail price. If I'm unable to use these hidden powers to increase my sales and improve my business or career, I can return this program within 30 days for a full refund. No questions asked. He has appeared on Fox News, ABC News, Today, CNN, Hardball with Chris Matthews, and NPR, as well as other media outlets, on topics as varied as interviewing, terrorism, and body language. As one of the leading experts in the world on nonverbal communication, he has shared his unique knowledge of human behavior with the intelligence community, as well as with the medical professions, the banking institutions, and the insurance industry worldwide. A much sought-after lecturer, Joe brings together his academic background, scientific research, and practical experience in catching spies and applies it to the art of observing and interpreting human behavior.